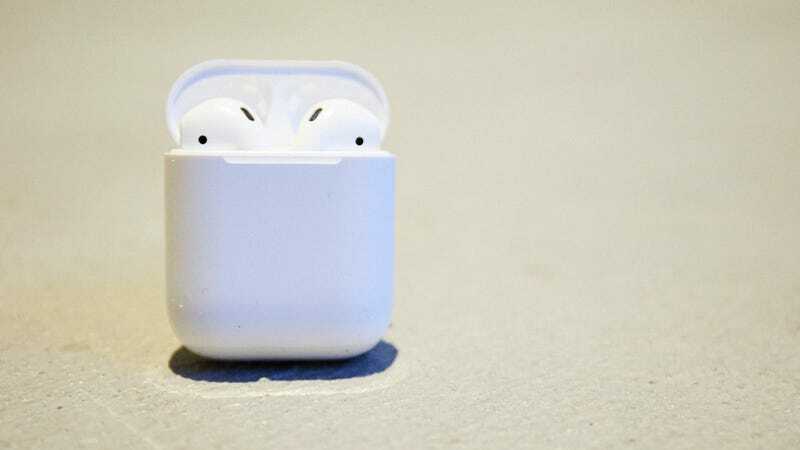 AirPods aren’t going anywhere, but there’s a lot of rumors swirling around what shape the next generation of Apple’s wireless earbuds will take. While it’s not likely we’ll see a refresh this year, a new patent awarded to Apple suggests interchangeable AirPods with at least one biometric sensor could be on the table for future models. The patent drawings showcase a design that can be “symmetric so the earbud can be worn interchangeably in either a left or right ear.” The biometric sensors would then be used to tell which earbud was in what ear and automatically adjust sound accordingly. There’s also mention of using foam to provide “constant force independent of ear size”—a departure from the all-plastic design of current AirPods. But while the patent does refer to health and fitness uses for biometric sensors, like heart rate, VO2 (maximum oxygen intake during exercise), and core temperature, it seems this filing is mostly focused on using sensors to identify which ear the AirPod is in. Because really, all I want from new AirPods is a guarantee they won’t fall out of my ear. Of course, patents have to be taken with a grain of salt. Even though Apple is purportedly overhauling the AirPod design for 2020, the tech outlined in this new patent may not actually make it into whatever product hits shelves. We’ve seen other AirPod rumors like patents for wireless case charging, as well as the now vaporware AirPower charging mat. Other whisperings include sweat resistance and Hey Siri integration. There’s even speculation over premium AirPods with noise-canceling. (So basically features already available on other wireless headphones.) At this point, it’s pretty much certain the earliest we’ll see an AirPod refresh is sometime in 2019. On top of wireless charging, it’s likely the refresh will feature slightly better connectivity and battery life based on recently awarded Bluetooth certifications. Interchangeable AirPods, like the new patent suggests, would be nice. It’s not a major gripe, but eliminating the five seconds to figure out which earbud goes in where would probably save me at least ten minutes throughout a year. More importantly, the overall shape of the new buds in the patent addresses one of the biggest problems folks have with AirPods: Fit. Because really, all I want from new AirPods is a guarantee they won’t fall out of my ear. There’s no point to adding biometric sensor (or health tracking) if these dang earbuds won’t stay where they’re supposed to. Other smart earbuds, like the Jabra Elite Sport, require an extremely secure fit to measure anything. They generally come with a small arsenal of ear fins and tips so you can make sure you get optimal contact between sensor and ear flesh. And while AirPods are decent for everyday commutes, Apple’s insistence on a one-size-fits-all approach for AirPods means they’re not high on the list of wireless earbuds you should use for anything more strenuous than a brisk stroll. Plus, adding health tracking is redundant when you consider the increased fitness focus of the Apple Watch—you know because you buy everything Apple sells. So for the love of god, if there’s only one thing AirPods take away from this patent, let it be those briefly mentioned foam inserts.